This article forms part of the section on the Negotiating Timeline: From Start to Finish, from the project “Peacemaking in Colombia: Lessons from the negotiators”, a collaboration between DemocraciaAbierta and the IFIT. Visit the Negotiations Timeline here. The exploratory phase had two very important dimensions. One was a lesson from the past: negotiators learned a lot about what would be optimal and useful in a given context. Second, the parties undertook a process of substantial reflection in terms of recognizing the decisions made on the other side of the negotiating table. In precise terms, besides recovering the lessons from the past, the negotiators reincorporated other variables as an innovative element for the Colombian experience. The international lessons from the past proved valuable in terms of looking at the dimensions of a particular challenge. In the exploratory phase, it was fundamental to design a scheme that indicated whether the other side was in a position to reach a political solution. In addition to this innovative element, during this phase, the negotiators used certain objective elements about the FARC to integrate them and start a dialogue. In a way, the exploratory phase served as a test, which then allowed to make the decision to start the process in the public phase. Simply having had the exploratory phase was a novel element to the peace process because these first contact-generated procedures that allowed decision making at the end of that secret, private and exploratory process. And there was a third variable: for the first time the negotiations had the figure of the guarantors who were, say, witnesses without a voice. The conflict represented a 50-year long journey of mistrust (with the FARC), which required covering important elements to guarantee greater points of contact. It is interesting to observe the different actors involved in the negotiations, and the various challenges that they helped to resolve. They can be divided into three principle groups. One group is composed of outside actors. Mr. Henry Acosta was one of these figures, who was very important in terms of providing the negotiators with a point of contact with the secretary of the FARC. This was an important turning point, as negotiators had never had access to this type of figure, except perhaps on an informal and variable basis. Instead, Mr. Acosta served as an interlocutor, having been in contact with the FARC for approximately 10 years. Second, there was a broad political trend in Latin America at the time which proved very important. Delivering this negotiation exercise in a period of changing political tendencies – particularly in the neighbouring countries of Venezuela, Mexico and Ecuador – had a particular affect. Centre-left governments across the region had been telling the guerrilla organizations for some time that armed politics was not viable. The third group were the guarantors of the negotiation. Beyond looking at this as an issue of the political left versus the right, the involvement of credible governments, such as Cuba, Norway, Venezuela, and the United States was entirely necessary. No agreement would have been possible without these actors, or without a high-level US emissary who served as witness to the agreements reached at the negotiations. That was important in terms of peace of mind for all parties involved. Communication was an important factor in building trust, and was perhaps one area where there was a critical deficit from the start. This was an inherent problem because while a negotiation was underway in Havana, the conflict was continuing in Colombia. While negotiators were making advances in substantive issues, the public did not have information regarding the confidential points of agreement due to the principle that nothing would be agreed until everything was agreed. Ultimately, it was very important that the government communicated concrete achievements to the public. There were two ways to address this issue. One was simply to bring both parties closer together and for them to see each other as cooperating partners. The other fundamental avenue for communicating success would be to convey that certain things negotiated in Havana would have a real and observable impact on the country. The government could have simply informed the people in the territories to wait three years to see if an agreement would be signed. However, the parties had to do more, including things that were reaching the FARC members in prisons so that they could see the peace process benefitting the country. Before an agreement was reached, the parties began to search for kidnapped and missing people. This allowed people to see the positive benefits of the negotiation, even if there was no signature on a final agreement. There was also evidence of landmine removal from a particular community’s territory, which made others realize how the political negotiations in Havana could impact their own communities. Overall, these confidence-building measures added a crucial aspect to the process. There was an initial bet that the process would start as a closed process, in a foreign country, with a ceasefire, and with a level of confidence never seen before. It is a political gamble to establish an agreement, make it public, and then let the people vote. 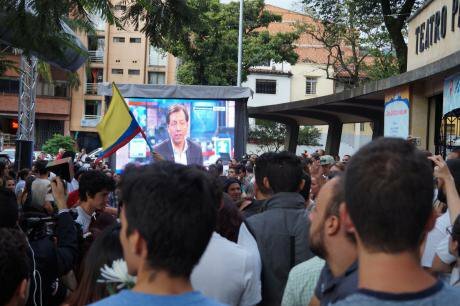 This happened on 2 October 2016, when Colombians rejected the peace agreement by a plebiscite in which the No vote won by a small margin of about 53,000 votes. However, rather than accepting this development in defeat, negotiators took it as an opportunity. Following the referendum, an important element was how quickly there would be a response. If the response had been delayed by eight days, it is likely a peace agreement would not have been signed. The guarantors played a highly important role in the referendum as well. The FARC recognized the implications of the referendum result, and it was helpful to have a government like Norway come in and say to the FARC, "Well, yes, this presents challenges, but my parliament won’t ignore what happened in Colombia, and won’t give up". The impact is more real for the FARC than for the government. It also allowed negotiators to understand all the nuances of the 'No' movement and the idea that someone who opposed the agreement was not necessarily a member of a paramilitary group – plenty of common citizens disagreed with the peace agreement. Taking those points into account, negotiators were able to enhance the agreement that was finally signed on November 24. In the long term, the challenge was to implement an agreement with a guerrilla force that had very little credibility and legitimacy within the democratic structure. Therefore, it was always understood that there are inherent risks to implementing the agreement within this democratic structure. In the medium term, negotiators insisted on a sustainable future for those people who put down their arms and were incorporated into legal political life, summarized under the notion of “coexistence”, something that should occur in the territories between the victims and perpetrators. And in the very short term, knowing that it has an impact in the long run, the challenge lies in making timely decisions to guarantee two things: One, making the process of FARC reintegration as seamless as possible; and two, how to establish in concrete terms the guarantees of security that were promised to the FARC. As long as they laid down their weapons they should be guaranteed security to participate in politics.